I was rummaging through my fiber stash last week and found a bag of alpaca roving that I bought a couple of years ago at Victory Ranch, near our place in New Mexico. (Roving is fiber that is carded, usually commercially, into a long continuous cord 2"-3" thick. The fibers are generally aligned in one direction. You can see a sample of it with the hat.) I loved this roving, but when I tried to spin it on my drop spindle, it proved to be too firm and slippery. My spinning wheel needs repair, so that wasn't an option. So I decided simply to crochet the roving, using a large (size N) hook. I added some thin handspun for color, and love the way it turned out. It's thick and warm, probably waterproof (it is alpaca, after all). But I really have to get my spinning wheel repaired. Here are some of the alpacas that generously provided this wonderful fiber--such sweet faces! I'm betting that my guy is the gray one in the center, since the fiber I bought matches his gorgeous gray color. I would love to have a couple of these here at MeadowKnoll, but it's really too hot for them. They would melt in our 30-day strings of 100+ summer temps. Book Report. Lots going on here. I'm working on The Last Chance Olive Ranch (China's 2017 mystery) and doing some interesting research into olives. Lots of stuff I didn't know. Learning, for me, is most of the fun of writing. I'm also working on getting Loving Eleanor out into the world. The book is available for pre-sale on Amazon. It's also up on NetGalley, pre-approved and available now for all NetGalley reviewers. The second GoodReads giveaway launched this morning, this one open to readers in the US, Australia, and Canada. (Tell your Aussie and CA friends about it!) On the book's website, you will find an excerpt from the book and photographs related to the first chapter. I've sent out nearly 50 advance reading copies to media and booksellers, and arranged for a blog tour in February/March. Whew. It's been fun (really!) putting all this together. If you can help get the word out about this book, I would be very grateful. A Wilder Rose. The option deal is done on A Wilder Rose, but that's as much as I can say at the moment. When we have a story outline and are approved for the script, I can give you all the details. It does look like this project isn't going to sit on a shelf, however--at least, not right now. I'm excited about it (naturally!) and will share the news as soon as I can. Reading note. " ....I swapt that calico dress which I had unmade at your house to Mrs. Hubbard for a black alpaca dress made as she wanted a calico so I made considerable by that trade I shall be glad of a black dress on the road I am quite out of under clothes & cannot get anything in the city. theres not a yard to be bought ..." Lucy Rutlege Cooke, a letter to her sisters from the Oregon Trail (1852) borrowed from Gateway Farm Alpacas website. By "unmade," she means that the seams were ripped and the pieces of the dress were washed and pressed--that's what she traded ("swapt") for the alpaca dress. Plains coreopsis--a beautiful flower, especially when they fill the whole meadow with their sunny yellow blossoms. But Coreopsis tinctoria (as you might guess from its Latin binomial) isn't just pretty to look at when it's blooming. It's a great dye plant, and has often been used to create a strong yellow-orange color on wool that has been pre-treated ("mordanted") with an acidic or alkaline substance to "fix" the color. I've used alum, which is easy to find and use and not as caustic as some of the other mordants. Cover the blossoms (dried or fresh) with water and soak overnight in an enamel or stainless steel pot, then simmer for an hour. Take it off the heat and let it cool. Meanwhile, soak your pre-treated wool yarn or fiber (you'll need about the same amount, by weight, as the flowers) . When the dye is cool, strain out the flowers through a couple of layers of muslin (you can compost the flowers or put them through another dyebath, for a lighter color). Squeeze the water out of the yarn and immerse in the dye. Bring to a simmer (please don't boil). Gently agitate the fiber every now and then (you don't have to stir, just push it around). After an hour, turn off the heat and let cool. Take out the fiber, rinse well, then wash in a mild soap and hang to dry. You can reuse the the dyestuff until the color is exhausted. 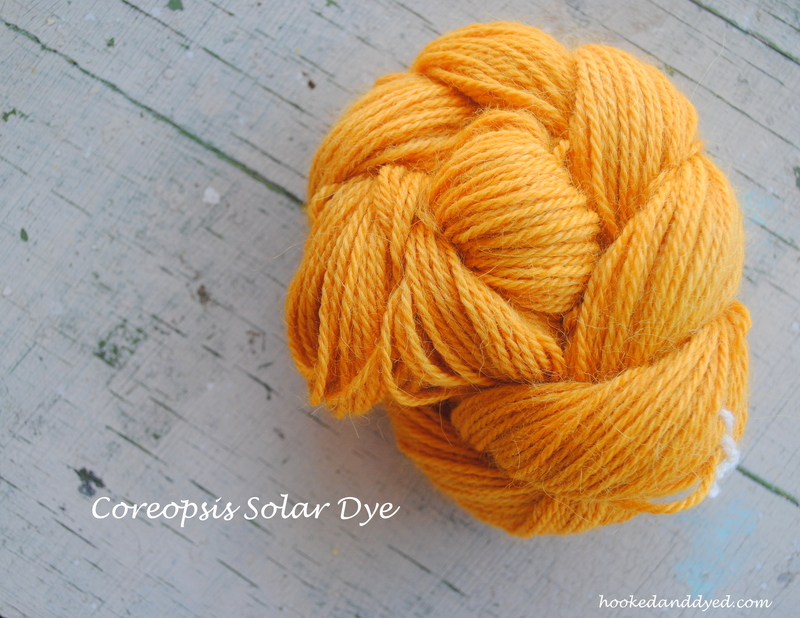 Here's an example of coreopsis-dyed alpaca, from hookedanddyed.com. Isn't it beautiful? You can see more here, and read about solar-dyeing. It's pecan harvest time here at Meadow Knoll, and Bill has been busy--working hard to keep ahead of the squirrels. The trays in this photo contain nuts gathered from a single tree, and we have 20 bearing trees. They don't all produce as well as this one, but all together, it's a good year for pecans. Bill grafted these trees, on native stock planted here and there by squirrels, floods, and other random acts of a kind and generous nature. He chose the natives for their sturdiness and location, and grafted them with scions (graftwood cut from the previous season's growth of a productive tree) of different cultivars: Choctaw, Desirable, Kiowa, Dobie. They usually bear in alternate years, but the drought confused them and they're out of sync. Still, this year is a good year and there are plenty of nuts. Bill gathers them; we settle in front of the TV for a shucking party; and then he takes the nuts to a guy in Bertram who cracks/shells them for us. We store them in the freezer--they keep well until the next crop. All of which means plenty of pecan pies, naturally, like this one I baked yesterday. Mix ingredients in order listed. Pour into pie shell. Bake 10 minutes at 425 degrees, 40 minutes at 325. We like this warm, with ice cream. "'Eat your food,' gently said Mom to little son Roddy. 'If you don't, I will break every bone in your body.'" Will make a wild man mild and a mild man vicious." The current sock project, in Hook 'Em Horns tweedy orange. (You Texas fans will understand.) I confess, though, that I've been carrying this second sock around in my knitting bag so long that I've forgotten the pattern. Before I pick up the needles again, I'll have to hunt up my notes (I've got a little knitting notebook where I write down pattern names, needle size, yarn, etc). Love doing socks, almost as much as I love wearing them. Also on the needles: a "spontaneous" blue scarf, done in seed stitch on #8 circs with homespun and bits of other yarns. Photo coming as soon as I get the time to weave in a few ends. You know how that is. A few years ago, I spoke at a meeting of the Kentuckiana Herb Society. One of the group members, knowing of my interest in altered books, made one for me, from a discarded hardcover copy of China Bayles' second adventure, Witches Bane. It was made to serve as a holder for a paperback book. But I remembered it the other day, when I was thinking of buying a jacket for my new Kindle (Bill is inheriting the Kindle I bought back in 2008). Book report. The Darling Dahlias are out there, and getting good reviews. If you want to make the peanut butter meringue pie, though, please use the corrected recipe. (Special thanks to Dani and Geni for pointing out the problem.) Next up on the writing desk: The Tale of Castle Cottage, the last of the Cottage Tales series. But I won't start that until next week: I'm heading for Houston toward the end of this week for a family visit and a Saturday noon booksigning at Murder by the Book. If you're in the area, do drop by. The Dahlias and I and David and McKenna (the owners of this terrific bookstore) would be delighted to see you. Guest blog alert. On Tuesday 7/20, I'll be a guest blogger at Molly Weston's Meritorious Mysteries, blogging about (what else?) the Dahlias. Molly has already posted her review of the book (yes, she liked it!). We're holding a book drawing, too, so be sure to come on over. What I'm reading. I was inspired by a friend (thanks, Sid!) to post a page of my reads and reviews. I'm just getting started with this work-in-progress, so check back every so often and see what I've listed. In the meantime, have a great week--and cross your fingers for no hurricanes in the Gulf and a quick kill on that blasted oil well. Stephen King, to his readers: I don't want to just mess with your head. I want to mess with your life. I want you to miss appointments, burn dinner, skip your homework. I want you to tell your wife to take that moonlight stroll on the beach at Waikiki with the resort tennis pro while you read a few more chapters. 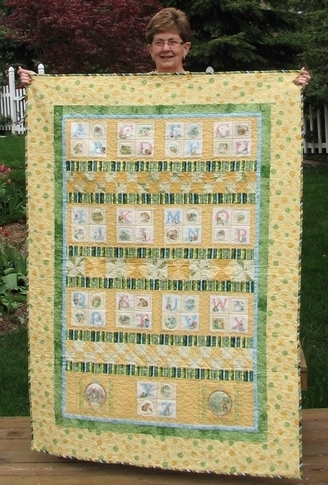 Isn't this a totally, incredibly, absolutely gorgeous quilt? It was designed and made by Jinni Turkelson of Grand Rapids MI--and then she sent it to ME, to keep me warm on cold evenings when I'm knitting by the fire. (That's Jinni, standing on a bench on her deck, holding the quilt.) Jinni, I love it, and I'm more grateful than I can say. You're a peach. And oh, BTW, I solved the mystery: Jinni said she practiced doing some alphabet work with her new sewing machine and told me to look for it. "It's a mystery," she said. 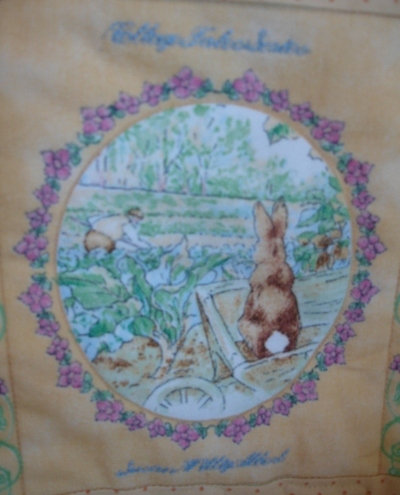 This isn't the greatest photo, but maybe you can see that she's embroidered "Cottage Tales Series" at the top and my name at the bottom of this lovely panel from The Tale of Peter Rabbit--Peter watching Mr. McGregor weeding the lettuces. UPDATE. 5/22/08. After I had a chance to study Jinni's quilt more closely and read everyone's comments, I've decided that I'm going to take it when I do book talks at libraries. The quilt will give me a chance to talk about the way one person's creativity (Beatrix's "little books") can inspire other people: can inspire the Cottage Tales, biographers like Linda Lear and Judy Taylor and many others who have written about Beatrix's life and work, as well as quiltmakers, artists, knitters, and embroiderers. Wouldn't Beatrix love the circle of friends her work has created? Writing note. I have the feeling that Jinni's quilt will do more than just keep me warm--it will inspire me, as I settle back to work on the next Cottage Tale. I'm into the third chapter now, in a scene with Beatrix and Will Heelis. The trick is to bring them closer together, romantically, but still find believable ways to keep them apart. This is only Book 6, and they can't get married until Book 8! Today, I'm working on a scene with a new character, Fritz the Ferret, who lives under the bridge over Wilfin Beck. Gardening note. I was a little late getting the squash in, but both the zucchini and the butternut are up and looking good. The madonna lilies are blooming. Photo tomorrow. Reading note. From Linda Lear's biography, Beatrix Potter: A Life in Nature, p. 234: [Beatrix] squeezed out every available moment at the farm, gardening and looking after the haying, but had little time or energy for books. "I cannot screw anything out of my head at present!" she told Millie [Warne, Norman's sister]. "I have done a little sketching when it does not rain, and I spent a very wet hour inside the pig stye drawing the pig. It tries to nibble my boots, which is interrupting. I don't think it ever answers to try & finish a book in summer..."
Fun socks. These are for Paula, my co-editor on the Story Circle Book Review website. I chose the colors by picking up colors from the multi yarn. 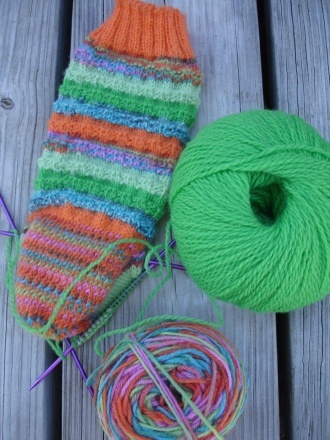 I love the way the heel worked out, multi twined with orange in a salt-pepper stitch. They're a bit on the wild side, but so is Paula, who blogs at redneckcrime.com. Working with her on the book review has been a blast. And that's the second big project. The first one was What Wildness Is This (the book we edited together a couple of years ago). A pair of socks is scant thanks for all the good times we've shared, most of them over the Internet. Isn't that wild, too? I'm still not writing, but I'm working, working hard. Peggy and I have assembled some issues of All About Thyme so they'll be ready to go out every Monday. That's a huge job, but I enjoy it and never fail to learn something I didn't know in the process. I've been thinking, though, that maybe I should go to bi-weekly, instead of weekly, just to cut down on the workload. If you have an opinion on the topic, weigh in. I've also been putting the blog tour together (more on that toward the end of the month), finishing the notes and citations for the memoir. Oh, and cleaning the office--that perennial chore that I hate while I'm doing it and absolutely love when it's done. The storm that caused the tornado devastation in the mid-states on Tuesday night went through here on Tuesday morning, dropping our temps by about 40 degrees. One brave daffodil is blooming--as soon as the wind drops, I'll go out and get her picture. I won't have many garden flowers this year (because the gardens were so badly damaged last summer), so I'll cherish every single one. Doesn't look like there'll be many wildflowers, either. No rain to speak of since September, so the bluebonnets will be sparse. But that's the blessing of living in a place for a long time. I know that while there may be only a few flowers, they will be beautiful, and that when the rains come--next year or the year after--so will the bluebonnets. I know that the hummingbirds will arrive around the 15th of March, and that the Monarchs will be sailing north through our woods not long after. Paintbrush and blackfoot daisy and monarda, all in their time. I can wait. Yum! Doesn't this look good enough to eat? Now, never mind the obvious little bobbles, and please overlook the crocheted embellishment where there was supposed to be a couple of garter stitch rounds. Just concentrate on the colors, which truly are yummy. 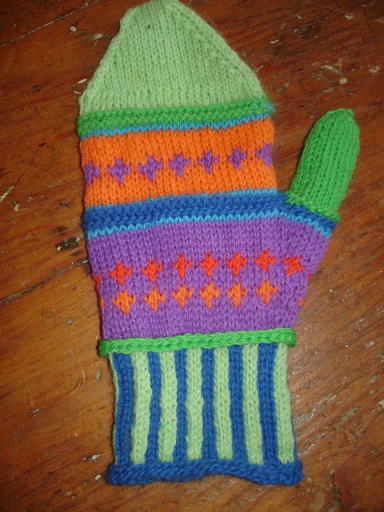 The pattern (slightly modified) is from Knit Mittens by Robin Hansen--the cover pattern. I can't decide whether to do the second mitten in entirely different colors, or stay with what I've already done. What do you think? Tomorrow's the official end of the blog tour, but there's still time to enter a few of the drawings (as of this moment, I mean), so hustle on over there and do it! One of the things I've learned on this tour is that computers and servers and networks don't always behave the way we expect them to. But the tour hosts and Peggy and I have persevered, and plugged on ahead, and just plain bullied our way through this, and it's almost over, thank goodness. Honestly, this has been nearly as much work as getting in the car and driving around from here to there! Except I get to sleep at home, which is pretty nice, and I don't have to eat on the road, and I can sit in my own favorite chair in the evening to knit candy mitts, so yeah, I like it. Think I'll do it again, when the next China comes out. Brrrr.... About 3 this afternoon, I looked out the window to see a flock of 30-some robins having lunch in the grass. Robins are migratory here, and they usually fly down with the first serious cold front--which was forecast for around 5 pm here in the Hill Country. Sure enough, about an hour after the robins, the wind picked up from the north, the leaves began to blow, and the cold front arrived, just in time for the dogs and me to have our evening walk in cool comfort. After yesterday's near-record 86 (honestly! ), this was a delightful change. Warmest November on record, so far, I've heard. So what else is new? But last night I watched a TV show about running out of oil (the inevitable conclusion of our spendthrift ways) and felt very grateful this morning when I woke and the world was all in one piece and so was I. I was glad for such an extraordinarily ordinary day, writing and robins and a north wind and a breezy walk with the dogs.